My love for running started 5 years ago whilst taking part in the London Marathon for Get A-Head. 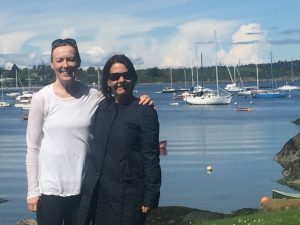 I had never dreamed I would be able to complete a marathon, having struggled with shorter distances and previous training – I really did not love running back then! However, something must have ‘clicked’ after that first marathon in London as I have not looked back since and gone on to run in Rome, Paris and Edinburgh amongst other cities. The one thing that kept me running through the winter months was the overwhelming support of friends and family and the incredibly generous donations to a charity that is very close to my family’s heart. My brother, chairman Tom Bromwich, has encouraged me to run London again this year and I can’t wait to retrace the route that I completed those 5 years ago. A lot has changed in that time, but I am still lucky enough to be able to fit in training around work and the Devonshire hills are a tough but beautiful training ground! 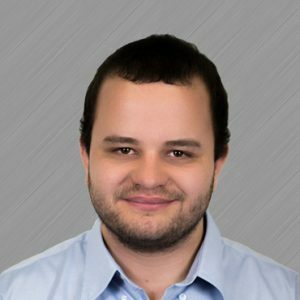 I was born in Coventry, England and lived in British Columbia from 1993, but moved back to the UK in 2018. A Banker by profession, I am now an Organizational Coach, with a special interest in personal wellness. I was a member of the Vancouver running community since 2002. 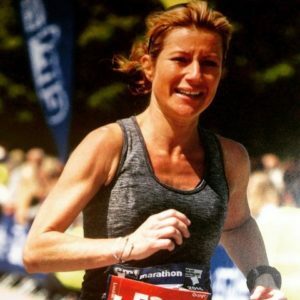 As a timid runner, who wanted to learn how to run for 30 minutes in 2002, I am thrilled to share that the 2019 London Marathon will be my 17th Marathon. I have known of the Get A-Head Charitable Trust for several years, as my close friend was supported by the Trust through her cancer journey. Now cancer-free, Wendy is a Trustee of the Charity and speaks highly of the support received in her time of need. For me, I have the opportunity to celebrate Wendy’s survival by showing my support to the Charity and for the work being carried out today for others fighting their own head and neck diseases. I use my love of running and cycling to participate in fundraising events for causes that are close to my heart, just as running and cycling are close to my heart. It is also a great honour to be running in my home country and participating in the greatest fundraising event on the planet. I will be taking part in the London Marathon 2019 on behalf of the Get-A-Head charity. 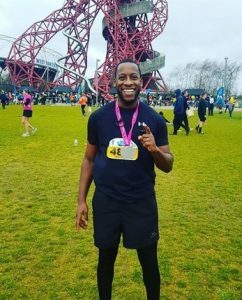 I didn’t have any running aspirations other than a couple of 10k runs and a half a marathon in my local area and when the opportunity arose for me to enter the London Marathon, after a lot of consideration I decided to go for it! Especially as the charity I am running for is very close to my heart. Over the last 6 years I have attended the Get-A-Head charity ball each year and being able to witness the extraordinary things they have achieved, and the importance of this charity defiantly pushed me to want to complete the London Marathon. Those that know me will know that I have done a few half marathons in my time, however never have I ever thought I would be able to take on a Marathon. On Sunday 28th April I am finally going to challenge myself to the ultimate run… the London Marathon! I am apprehensive, but so, so, excited to be part of this amazing event and privileged to be a member of Team Get A-Head! Get A-Head are a local charity, based in Solihull and their mission is to help improve the quality of life to people who unfortunately suffer from head and neck diseases and their cancers. The research and work that they have previously and are currently undertaking is invaluable to such patients. For example, helping to purchase life changing equipment for patients who have lost their voice through cancer, with things like Electro-larynx’s and iPads, to help them communicate with loved ones. 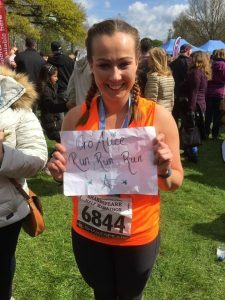 This will be my 19th London Marathon, I am running for the Get-a-head charity after being told by my best friend about the fantastic work they did for someone close to her family and I feel honoured to be running for them! Having done a few marathons people sometimes assume I’m fast however, I am by no means a ’speedy’ runner, infact I’m not really very good at it and have been know to be dragged along by rhinos, trees and once a 96 year old had to help me!! I take part in the London Marathon because it’s a day where all is good in the world, everyone is kind and looks after one another and we are all there to raise money for wonderful causes such as get a-head! 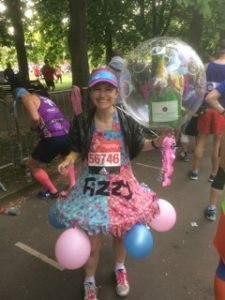 Each year I run in my ‘Dizzy Fizzy’ costume – I’m hoping all the balloons will help me towards the finish line! The attached photo is of me at the start of 2017 marathon (I didn’t make it to 2018 start line as I had a 2 week old baby!! 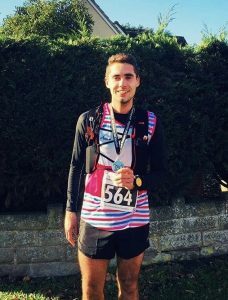 Born and raised around Bromsgrove, Worcestershire, marathon running (or running in general hasn’t really been a big part of my life). For anyone that knows me, I struggle to walk from the front door to the car without moaning so this will be an impressive task for me. The furthest race I have done thus far is 10k. However when the opportunity came up to run the London Marathon on behalf of the Get Ahead Trust I couldn’t turn the once in a life chance down. I have been introduced to the team at Get Ahead via their annual Ball in November and via my workplace, and to support them in any way is truly a privilege. I am very grateful to Get A-Head for giving me the opportunity to run for this great charity at this year’s London Marathon. I have had family members that have suffered from cancer and charities like Get A-Head are so vital in the support they offer. I look forward to raising money to help towards this charity. 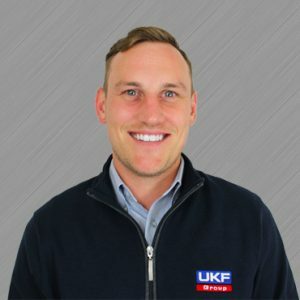 It has also been a personal ambition of mine to take part in the London Marathon, I am excited for this challenge and look forward to seeing my family and friends at the finish line. They’ll be joining over 35,000 runners taking part in one of the most iconic marathons in the world. We’d like to thank them all for running and if you want to sponsor any of them please follow the links to their fundraising pages.